“How strange it is that a bird, under the form of a woodpecker, should have been created to prey on insects on the ground; that upland geese, which never or rarely swim, should have been created with webbed feet; that a thrush should have been created to dive and feed on sub-aquatic insects; and that a petrel should have been created with habits and structure fitting it for the life of an auk or grebe! and so on in endless other cases. But on the view of each species constantly trying to increase in number, with natural selection always ready to adapt the slowly varying descendants of each to any unoccupied or ill-occupied place in nature, these facts cease to be strange, or perhaps might even have been anticipated”. Serious systems thinking about ecology began In the mid-1900s when two groups of botanists, one in Europe and the other in the United States, studied plant communities from two different points of view. The European botanists concerned themselves with the study of the composition, structure, and patterned distribution of plant communities. The American botanists studied the development of plant communities, a process in time described as succession, which emphasised the interrelation of both plant and animal communities as a living process. 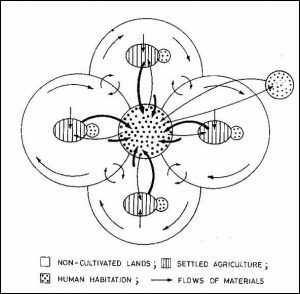 From 1905, Frederick Edward Clements merged these two streams of research to promote an holistic view of communities as organisms and of the plant formations as superorganisms, progressing towards a climax steady state. At the time of these international debates about communities and their similarities to organisms, the British biologist, Arthur George Tansley, recognised the need for a non-community-based descriptor of nature. While agreeing that ‘mature well-integrated plant communities … had enough of the characters of organisms to be considered as quasi-organisms’, he wished to introduce a broad term to comprehend not only the organisms but also the complex interactions between living and physical factors. In this connection, Tansley had asked Arthur Clapham (then a young man in the Department of Botany at Oxford) if he could think of a suitable word to encompass the dynamic physical and biological components of environment as a unit. Clapham came up with the term ‘ecosystem’, which Tansley first used in 1935 . Around this time the concept of ‘niche’ emerged to describe the place or function of a given organism in nature. A niche refers to the way in which an organism fits into an ecosystem. Through the process of natural selection a niche is the evolutionary result of the physical structure of a species and the physiological and behavioural adaptations to its surroundings. A habitat is the actual location in the environment where an organism lives and consists of all the physical and biological resources available to a species. The collection of all the habitat areas of a species constitutes its geographic range. Among the first to use the niche concept was Joseph Grinnell in 1917. He viewed the niche as the functional role and position of an organism in its community. Grinnell considered the niche essentially a behavioural unit, although he also emphasised it as the ultimate distributional unit of all life forms, thereby including spatial features of the physical environment. Charles Elton in 1927, defined an animal’s niche as “its place in the biotic environment, its relations to food and enemies” and as “the status of an organism in its community.” Further, he said that “the niche of an animal can be defined to a large extent by its size and its feeding behaviour, Thus, ecology deals with the organism as a population and as individuals with respect to all their interactions with environment. In particular it includes the ways in which individuals modify their surroundings to produce a living space that is safe and productive, The Eltonian niche emphasises the functional attributes of animals and their corresponding position in food chains. The concept of the ecological niche now pervades all of ecology. Were it not for the fact that the ecological niche has been used in so many different ways, ecology might be defined as the study of niches. For example, the Ouse Washes, a large area of unimproved winter wetland in the UK, holds important niches for ducks, coots and moorhens. There is clear niche partition of this habitat between species. In an area of about 500 ha, dabbling ducks nest on higher drier ground, whilst coot nests are surrounded by water: moorhen nests were intermediate in their positions. Gadwall, tufted duck and pochard nest within 10 m of water whilst other duck species nested between 10-60m from water. The preferred duck nest sites are in tussocky grasses, especially of Deschampsia caespitosa, whilst coot prefer the non-tussocky Glyceria maxima. The height of vegetation at the nest is greater than around the nest for all species. Mallard and gadwall and tufted duck prefer to nest in unused or lightly grazed fields. whilst shoveler and pintail preferr the more heavily grazed fields (> 90 cow days/acre). Coot and moorhen show no such preferences. Ditches and permanent pools hold most of the waterfowl broods, whilst the temporary pools hold most of the adults not involved in rearing young. Where different species are found together the habitat is partitioned through differences in feeding behaviour. In this connection, a fundamental niche can be defined as the range of environmental conditions in which each of the species survives. The realized niche can be termed as the range of environmental conditions in which a species is really found. For example on the rocky coast of Scotland the fundamental niche of the barnacle Chthamalus includes both shallow and deeper zones, but its realised niche is much narrower because Chthamalus is outcompeted by Semibalanus in the upper part of its fundamental niche (Fig 1). The ecological niche has been defined in terms of the distribution of species, the functions they perform and the resources they consume. Over the years this niche concept has been used by anthropologists in a number of ways as a specialised part of human society, as being synonymous with culture, and as a segment of the habitat. 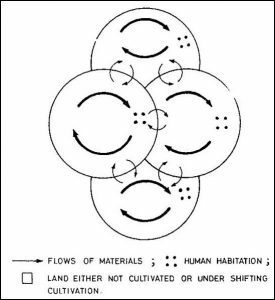 Odum, thinking in a broad biological context, compared the niche to the profession or way of life of the organism while noting that the habitat is equivalent to its ‘address’. The way of life is more precisely specified by Hutchinson as the total requirements of survival for the organism. Consequently, the human niche comprises all those conditions necessary for humanity to exist. In a local context it can be a living space, with a distinctive way of life, such as a self contained tribal settlement, a fishing village or a coal mining community with marketing links to the outside world. 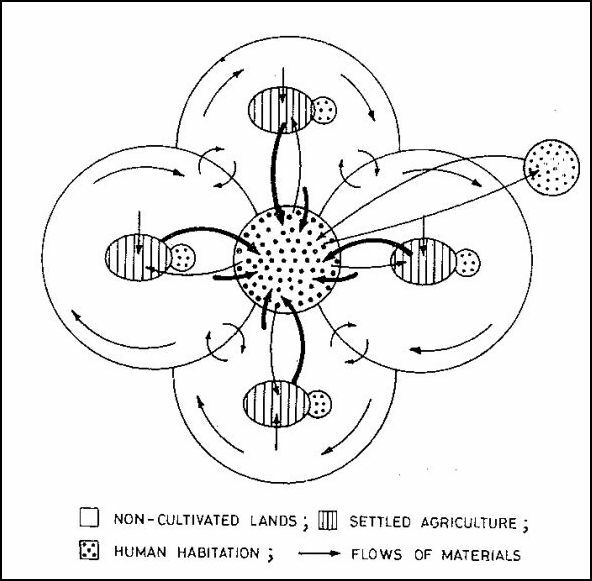 It was Donald Hardesty in 1972 who took up this “multi-dimensional” concept and applied it to discussions of the human ecological niche, believing it renders the niche concept of greater value to studies of all human activities, emphasising that we are part of nature in everything we do to occupy our time. First, is the activity compulsory or optional? Here we must consider two subordinate questions. If compulsory, is its necessity absolute (unconditional) or relative (conditional)? If optional, is it also morally obligatory for the purpose of leading a good life or living well, even though it is not biologically necessary for the preservation of life and health, and not economically necessary for earning a livelihood — the means of subsistence? If optional and not morally obligatory, is it nevertheless morally permissible because it does not frustrate our efforts to lead a decent human life? Second, what purpose does the activity serve? Why do we engage in it? What goods or values do we achieve by doing it, either for ourselves or for the society in which we live? Third, how is the result we achieve by the activity related to the activity by which we achieve the result, and also how is it related to the agent performing the activity? On the one hand, the result — the good or value aimed at by the activity — may be extrinsic to the activity. It may be a consequence of the activity, one that follows from it and lies beyond it. On the other hand, it may be inherent in or intrinsic to the activity itself. When the activity has no consequences as part of its purpose or aim, it is strictly nonutilitarian. When it is utilitarian, it may, on the one hand, result in some perfection or improvement of the agent performing the activity; on the other hand, it may improve something other than the performing agent. The result may also be only a good or value for the individual performing the activity, or it may also be a good or value for the society in which the performing agent lives. Fourth, what sort of activity is it? Is the activity physical, mental, or both in different measures: more or less physical, more or less mental? These activities, Jerry Coyne explains, are what Pinker sees as the “cognitive niche” (a term invented by John Tooby and Irv DeVore) as a description of the human lifestyle where both thought and social cooperation blend to manipulate the environment in which we move and reproduce. This involves, for example, using tools, extracting poisons from plants, and all the stratagems of cooperative hunting: planning, communicating, making traps, and so forth. Pinker sees several “preadaptations” that facilitated our entry into the cognitive niche. By “preadaptation,” he means features that evolved for one purpose but could subsequently be co opted for a different one. One such feature is our prehensile hands, perhaps themselves a byproduct of bipedality. Another is our diet, which includes meat: as Pinker notes, meat is “not only a concentrated source of nutrients for a hungry brain but may have been selected in turn for greater intelligence because it requires more cleverness to outwit an animal than to outwit fruits or leaves.” A third preadaptation is for group living. A group is a collection of individuals who have relations to one another that make them interdependent to a significant degree. As so defined, the term group refers to a class of social entities having in common the property of interdependence among their constituent members. The hominin niche became increasingly structured for group living in a mutually interdependent world, where individual relationships shape socially shared meanings, while these simultaneously inform the individuals’ understandings of their actions. This culture was defined as the ecology of the mind by anthropologist Gregory Bateson. For example, it began with hunter gathering and the sophisticated coordination of collective meat procurement, a willingness to provide others with resources, the occasional, but critical reliance on resources produced by others, and procedures for the fair sharing of meat and collective duties. The availability of lethal weapons in early hominin society helped to stabilize this system because it undermined the tendencies of dominants to exploit others in society. Thus two successful sociopolitical structures for group living in a hominin cognitive niche arose to enhance the flexibility and efficiency of social cooperation.. The first was the reverse dominance hierarchy, which replaced social dominance based on physical power with a political system in which success depended on the ability of leaders to persuade and motivate others. The second was cooperative breeding and hunting, which provided a strong psychological predisposition towards prosociality and favoured internalized norms of fairness. 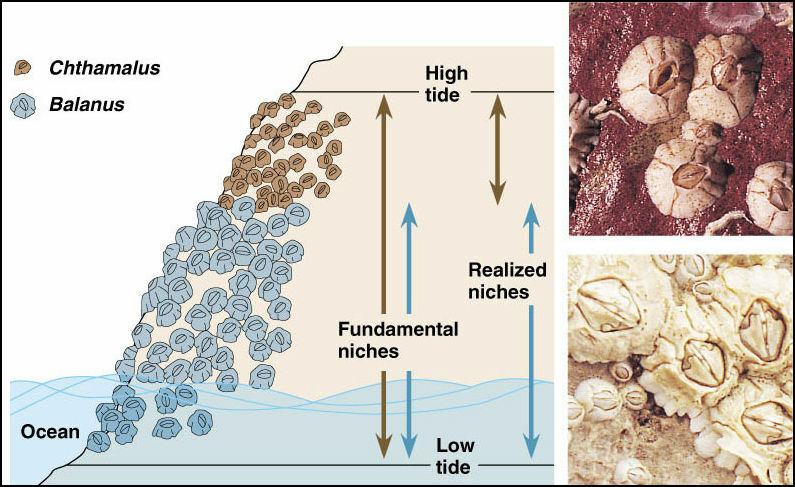 This survival system seems to have persisted as a major feature of the human ecological niche until cultural changes in the Holocene fostered material wealth accumulation. Through wealth it became once again possible to sustain a social dominance hierarchy based on coercion. This broad view of cultural ecology has important implications for political theory and social policy, for it suggests that human groups are predisposed to seek dominance when this is not excessively costly, but also to form coalitions to depose pretenders to power. Moreover, humans are much more capable of forming powerful and sustainable coalitions than other primates, due to enhanced cooperative psychological propensities. Where such groups are organised around the exploitation of a local natural resource the community is called an ecumene. Ecumene is derived from the Greek root oixos meaning inhabited and nenon meaning space. It generally refers to land where people have made their permanent home, and to all work areas that are considered occupied and used for agricultural or any other economic purpose. Thus, there can be various types of ecumenes, each having its own unique characteristics (fishing ecumene, agricultural ecumene, industrial ecumene, etc.). Staithes, on the north-east coast of Yorkshire, was an ecumene of some standing that was based on inshore fishing. It landed sufficient cod, mackerel and haddock for the North Eastern railway to run three or four special fish trains a week. Lining was one of the methods by which the fish were caught. The lines of hooks were baited with mussels, or sometimes limpets (Fig 2). It was the role of women to bait the hooks and carry them down to their menfolk on the beach The women wore homemade traditional utilitarian bonnets, which were padded at the top to help carry the coiled lines in head baskets. They were also flared at the sides to stop the coils of hooks and lines becoming entangled in their hair. Each bonnet required a yard of material, and was double-plaited at the front and tied at the back with a bow. The bonnets were incorporated as social signals into village life. They were white in colour but when a woman was widowed the colour of the material was changed to black, which was worn for a considerable time after the bereavement. This bonnet, in turn, was then exchanged for one of a mauve coloured material. 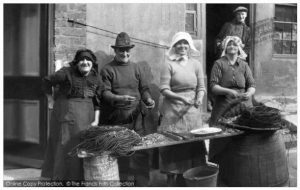 Although bonnets were characteristic of many fishing villages along the East Coast, those produced by Staithes families were the most significant markers of the village ecumene. Every ecumene is a band with strong bonds to its territory defined by characteristic social hardware and software, that enables its people to occupy a distinctive spatially disjunct niche with persistence of social practices favouring sustainable resource use. Social hardware refers to the forces and relations of production, namely the technological infrastructure and the property systems, e.g.commons, family communal corporate or state owned. Social software refers to the belief system eg. religion, tradition or science which legitimises and validates human interactions with nature via its political and natural economy. In an anthropological context political economy has come to mean the organisation of people for production. It runs alongside natural economy which is defined as the organisation of resources for production. These economies devoted to managing the use of resources are the two sides of the coin of world development and together they provide an educational framework for organising cultural ecology as a distinct body of knowledge. This implies that many forms of sociopolitical organisation for group living, from tribes to nations, are compatible with the particular human amalgam of hierarchical and anti-hierarchical predispositions. In particular, there is no inevitable triumph of liberal democratic over despotic political hierarchies. An open society will always be threatened by the forces of despotism, and a technology could easily arise that irremediably places democracy on the defensive. The future of politics in our species, in the absence of concerted emancipatory collective action, could well be something akin to George Orwell’s 1984, or Aldous Huxley’s Brave New World. Humans appear constitutionally indisposed to accept a social dominance hierarchy based on coercion unless the coercive mechanism and its associated social processes can be culturally legitimated. It is somewhat encouraging that such legitimation is difficult except in a few well-known ways, based on patriarchy, popular religion, or liberal democracy. Thus, every place is a blend of cultural, spiritual, political, social, and emotional notions. In her book ‘Whose India?’ Teresa Hubel introduces a notion that place is a property of the imagination . She presented the idea that whoever speaks to and for India’s people, and whoever imagines India’s past or destiny with the hope of determining its future, can be said to be a part owner of the notion. Going a step further along this line of thinking, Hubel’s notion is actually multi-layered. It is applicable globally and extends down to the level of the smallest place where people gather. Place belongs to whichever individuals or groups are able to constitute its formation in discourse. Kipling and Rushdie are two ethnically distinct individuals who both stake their legitimate claim to the ownership of India by the very act of writing about it. A group or individual who simulates a virtual presence in a place in the real world thereby establishes ownership of that place: thereby place comes to have a personalised psychological existence and a sector within a person’s ecological niche. Ecumenes are the outcome of managing specialised behaviours governing settlement to exploit a local natural resource. Regarding the bulk of the European population, at the start of the eighteenth century it lived off the land, but one-third of this rural population gained their living by means other than farming. Much of the non-agricultural workforce comprised carpenters and blacksmiths, carters and shopkeepers, tailors and shoemakers. All were essential to the rural economy. The niches of these craftsmen-retailers can be assessed through their listings in numerous trade directories that were published at this time. Such analysis highlights the limited capitalisation of their craft activities and their close involvement with agricultural pursuits, including the ownership of livestock and husbandry ware. It also reveals the close social ties which they enjoyed with their rural communities. Friends and family were primarily rural, as were their customer and credit networks. The tribal history of the areas occupied by villages and market towns, defined by land divisions such as parishes and hundreds, are evidence of the ancient settlements of families which ensured a fair allocation of ecosystem services within a village niche. The human ecological niche can be thought of as a focus for group living sustained by the management of ecosystem services for rural and urban settlement: a management system which now connects people to all parts of the globe. In this context, four categories of ecosystem services are provided by nature. Territory is conceptualised as that which links people and their environment. It is a unique, socially and materially constructed, or produced ‘ecological niche’ and at the same time the ‘social space’ of a group of people, defined by their spatial identity. Territory is a structure that is embodied in reality and that ‘lives’ in people’s minds as well as in their practices. It has an underlying infrastructure of common rules or codes and of network of material and informational flows. Material flows are now defined as services produced by nature; the so-called ecosystem services. When people are asked to identify a service provided by nature, most think of food. Fruits, vegetables, trees, fish and livestock are available to us as direct products of ecosystems. A provisioning service is any type of benefit to people that can be extracted from nature. Ecosystems provide many of the basic services that make life possible for people. Plants clean air and filter water, bacteria decompose wastes, bees pollinate flowers and tree roots hold soil in place to prevent erosion. All these processes work together to make ecosystems clean, sustainable, functional and resilient to change. A regulating service is the benefit provided by ecosystem processes that moderate natural phenomena. As we interact and alter nature, the natural world has in turn altered us. It has guided our cultural, intellectual and social development by being a constant force present in our lives. The importance of ecosystems to the human mind can be traced back to the beginning of mankind with ancient civilizations drawing pictures of animals, plants and weather patterns on cave walls. The natural world provides so many services that sometimes we overlook the most fundamental. Ecosystems themselves could not be sustained without the consistency of underlying natural processes, such as photosynthesis, nutrient cycling, the creation of soils and the water cycle. These processes allow the Earth to sustain basic life forms, let alone whole ecosystems and people. Without supporting services, provisional, regulating and cultural services would not exist.. The origins of the ideas in ‘This Fissured Land’ is in the 1990s thoughts of Gadgil and Thapar who defined the history of cultural ecology with reference to the flows of resources within four models of Indian society.. 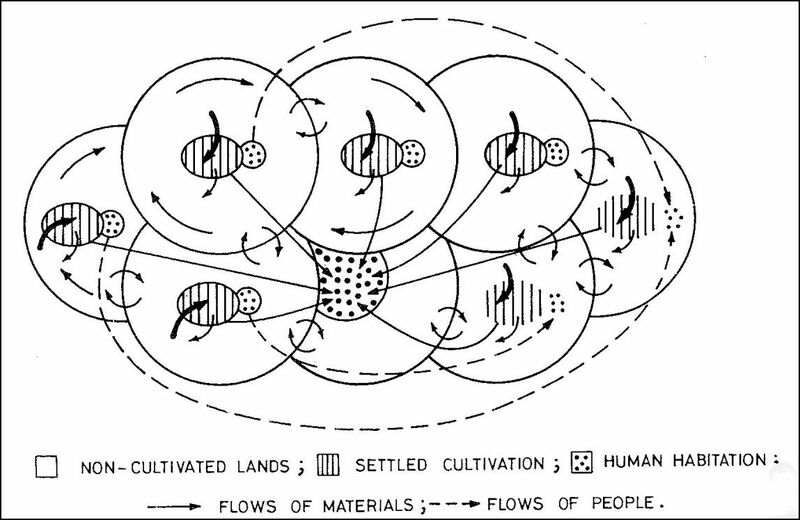 Fig 3 Material flows in territories maintained by hunter-gatherers. The thickness of an arrow indicates the intensity of flow. Settled agriculture makes possible generation of surplus grain and livestock production which can support concentration of non agricultural populations in towns and cities. This material export from cultivated lands has to be made good by flows from surrounding non cultivated lands. Material cycles thus become much more open in comparison with the hunter gatherer shifting cultivator stage. Settlements adjacent to cultivated land represent villages, the larger habitation in the centre, towns. (Fig 4). 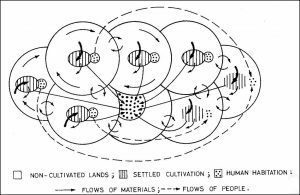 When settled agricultural populations are newly colonising river valley plains they would tend to use the cultivable lands exhaustively without making good the losses induced by outflows of materials. 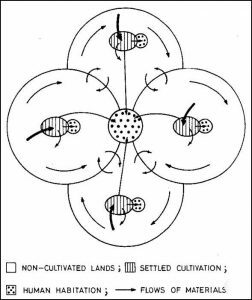 As cultivated lands lose fertility people would move on to settle new areas. 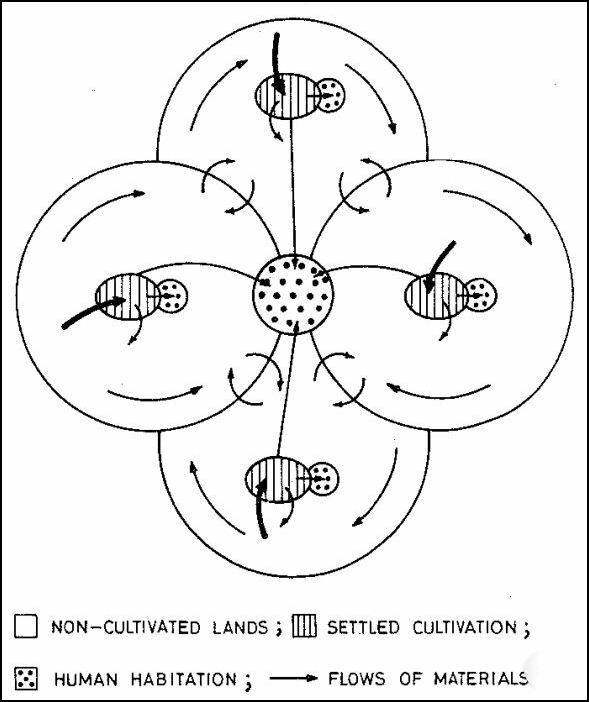 Settlements adjacent to cultivated land represent villages, the larger habitation in the centre, towns (Fig 3). Modern societies tap not only surpluses of agricultural production but also a great deal of the produce of non cultivated lands to meet the requirements of the urban industrial sector The material cycles thus become totally open with large outflows from rural hinterlands. These are partially compensated for by the organisation of flows of materials such as fertilisers from the urban industrial sector to the cultivated lands. The large central human habitation represents an Indian city such as Bombay. The habitation in the upper right hand corner represents the industrialised countries. (Fig 5). A modern society taps not only surpluses of agricultural production but also a great deal of the products of non cultivated lands to meet the requirements of the urban-industrial sector. 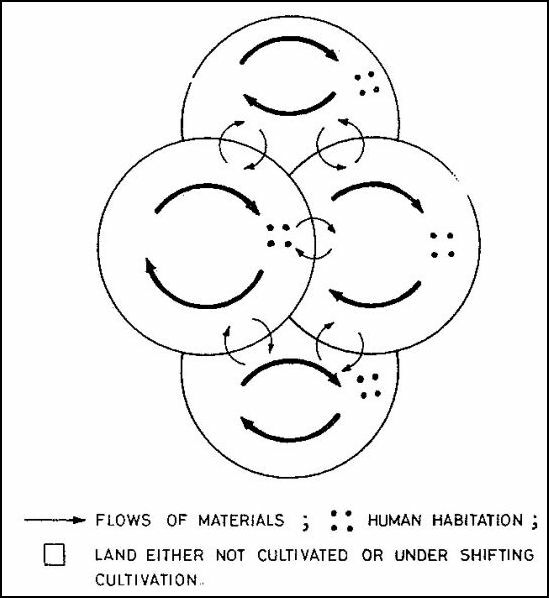 The material cycles thus become totally open with large outflows from rural hinterlands. These are partially compensated for by the organisation of flows of materials such as fertilisers from the urban-industrial sector to the cultivated lands. The large central human habitation represents an Indian city such as Mumbai: the habitation in the upper right hand corner represents the industrial countries (Fig 6). You are currently browsing the Cultural Ecology blog archives for March, 2017.